Over the past few weeks, I’ve been going in depth about all of the basic home brewing equipment that someone looking to get into brewing beer at home would need. I’ve broken it down into equipment that you’ll need for the day you brew your beer, the stuff you’ll need so that your beer ferments smoothly and everything you’ll need to bottle your beer. It’s not an end all be all list by any means, but it is all the required equipment that you’ll need, along with a few bonus items to make sure it turns out alright. 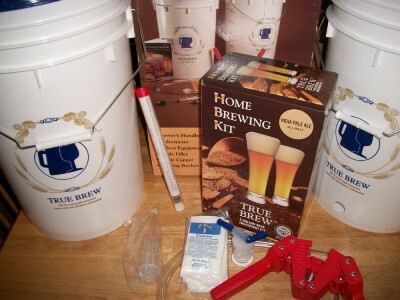 Homebrewing Equipment Kits Versus Buying Individually: If you’re just starting out and don’t have any equipment, start out with this article which explains why you should start off with a home brewing equipment kit instead of buying all of the pieces individually. Sanitizers: The liquid that you use to protect your beer from evil infections. Brew Pots: Who knew that a stock pot could be so interesting. Thermometers: You don’t have to be exact, but beer at the right temperature range will end up tasting a whole lot better. Wort Chillers: The one gadget that will impress your friends. Okay, maybe just the plumber but it will improve the quality of your beer. Hydrometers: Make sure that your wort and soon to be is on target. Plastic Fermenting Buckets And Glass Carboys: Where are you going to put your beer so that it can ferment? Airlocks And Blow Off Tubes: Uses these to release gases from inside your fermenting bucket and keep out harmful air that could ruin your beer. Tubing And Siphoning: How to get your future beer from one place to another. Bottling Buckets, Racking Canes And Spigots: Equipment needed to get your beer from the fermenting bucket to the bottles. Bottles: You’re going to have to put your beer some place, so where are you going to get all of those bottles? Bottle Caps And Bottle Cappers: The most satisfying party, besides drinking your beer is probably putting the bottle cap on it. Next, I’ll cover a little bit about the ingredients that you’ll need to brew your beer.